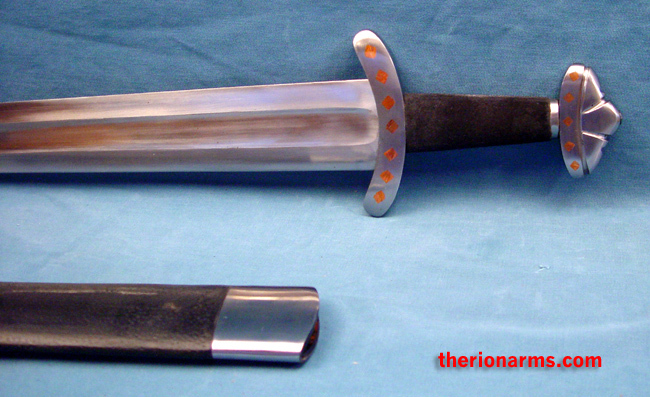 Reproduction of a 10th century viking sword found in the Witham River in Lincolnshire (east England). The blade of this sword is hand forged and hand tempered 5160 carbon steel. The pommel and cross guard are polished steel with copper diamond inlays. 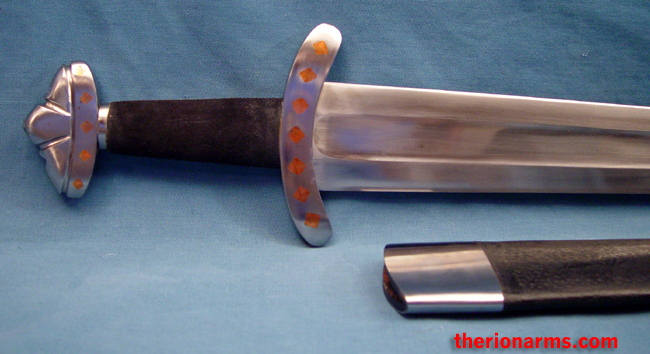 The grip is wood wrapped in leather, the scabbard is also wood wrapped in leather with steel accents at throat and tip. This is an extremely sharp blade, with impressive cutting power. "This sword is one that I have wanted to copy for years. There have been several attempts, but none have completely satisfactory. Adequate, yes, but not truly satisfying. At least until this one. Several years ago I had the chance to visit Sweden and Gotland to look at Viking artifacts as well as the remains from the Battle of Visby. One thing that I noticed, but have not encountered in any works on the Viking sword, is that the Swedish swords all seem to be a bit large than those I saw in Norway and Denmark. Of course it could have been just luck that the ones I saw in Sweden were larger, I have no way of knowing. But this sword could easily qualify as a Swedish sword. 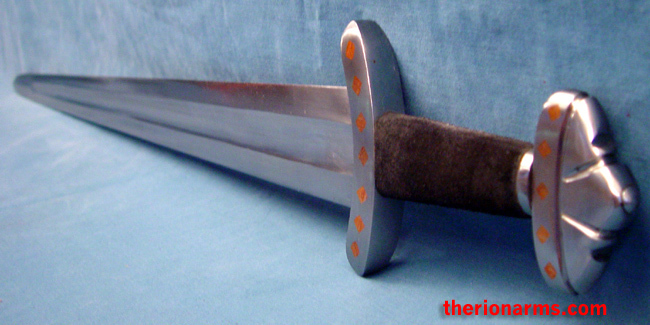 The blade is 77.8 cm, and is slightly over 6cm wide, and the balance point is about 16 cm. from the grip. This is a true warrior.s sword, the weight is about 3 pounds, but the balance is superb. The cutting power of the sword is quite impressive and I can easily see it being wielded by Skarp-Hedin or Egil Skallagrimson. Hand forged, high carbon steel."